On Wednesday, 16th March, Mayor of Drogheda Paul Bell, and the former Mayor of Salinas City in California, Dennis Donoghue (representing the current Mayor Joe Gunter), took part in a symbolic shamrock-giving ceremony video-link. The video-link also included Jennifer Krebs of The Western Growers Centre for Innovation and Technology in Salinas. This marked the renewed commitment of co-operation between Salinas and Drogheda in the Ag-Tech sector, and the additional potential collaboration of Drogheda’s Mill Enterprise Hub with Western Growers Centre for Innovation and Technology in Salinas. Drogheda has already hosted a number of visits from the former Mayor of Salinas, Dennis Donoghue, who has been in agribusiness since 1988 and is also a key player in the re-birth of Salinas as it moves from ‘the Salad Capital’ of The United States to becoming a champion in the Agri-Tech sector. According to Dennis, “the long-standing relationship between Salinas and Drogheda will be improved, and the co-operation between both Innovation Centres and regions, offers a great opportunity to further cement the strong partnership, and take a leading role in a rapidly-expanding sector”. Mayor Bell participated in the ‘Shamrock-giving’ video-link, and reconfirmed Drogheda’s commitment to further develop the relationship with Salinas City, “Salinas has actively positioned itself as the central point where technology meets the agri-food sector, and we would be delighted to expand on that relationship. Both Salinas and Drogheda have common traits including the fact that they’re natural Gateways to the region’s agri-food sector, but are also in close proximity to the technology epicentres of Silicon Valley, and Silicon Docks in Dublin”. 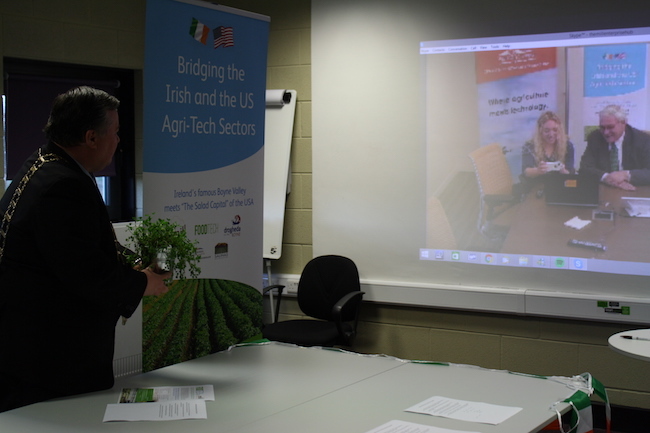 A key objective is to see Irish–Americans, and both regions, coming together to develop a mutually beneficial network in the Ag-Tech sector. Similar to Salinas, Drogheda, The Boyne Valley, and the North-East of Ireland has a very strong tradition of agri-food companies, from Boyne Valley Foods, to Natures Best and Keelings. Breanndan Casey of The Mill stated “We believe there is strong potential for existing rural & urban agri-food businesses in the region to develop their business by adopting high-tech solutions. The International linkage would highlight best practise in both countries, and harness the expertise of many Irish-Americans who now have a leadership role in the US Agri-Tech sector. The Western Growers Innovation Centre is a key partner in The Thrive Accelerator programme for technology-enabled Startups in the AgriTech and FoodTech areas, and I believe we can form a mutually-beneficial partnership. The Mill ran a series of FoodTech seminars in 2015, and we are working on similar initiatives for 2016”.